The original Sawmill Island bridge that was in place for 40 years. After nearly 40 years of faithful service the bridge connecting Sawmill Island to the maintenance road has been replaced. JROC approved and spent $2,158.16 to replace the bridge and ensure decades of easy access for hikers, bikers, and anyone out exploring the park. The demolition and construction took place over two weekends this January and is complete. The bridge is back in full service. 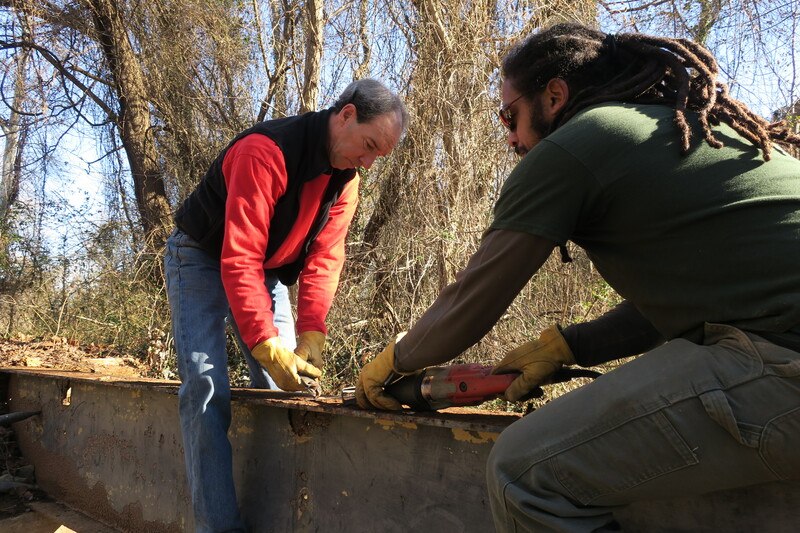 JRPS staff and JROC volunteers work on rebuilding the Sawmill Island bridge. Will and Greg lay down new stringer boards on the steal support beams of the bridge. Park Manager Nathan Burrell works on the new Sawmill Island bridge. Greg and Nathan cut the old carriage bolts off the steal support beams.